Boasting spectacular views of the San Francisco Bay, Governor Gavin Newsom’s recently renovated midcentury home seeks a new buyer. 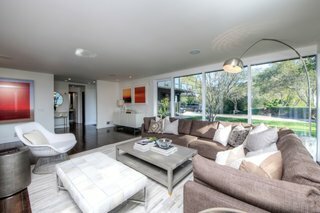 Shortly after Gavin Newsom took the helm as California’s 40th governor, he and his wife, Jennifer Siebel Newsom, left Kentfield for Sacramento and put their sleek Marin County midcentury abode on the market for $5,695,000. 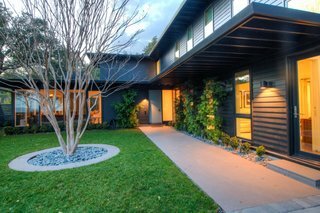 Built in 1950 and extensively remodeled over the years, the L-shaped midcentury house is optimized for indoor/outdoor living. 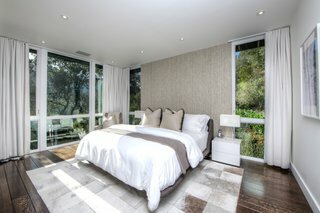 The couple purchased their former home for nearly $2.2 million in late 2011—following Newsom’s appointment as lieutenant governor—and doubled the property’s footprint to 4,014 square feet with two extensive renovations, the most recent of which was conducted by San Francisco–based architect Julie Dowling. The house is powered by rooftop solar panels. Walls of glass bring in views of the outdoors. The extensive remodels have been sensitive to the original 1950 design by Bay Area architect Worley K. Wong. 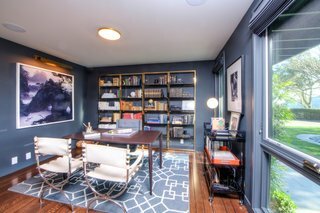 Formerly a modest three-bedroom abode, the updated house now has five bedrooms, four full baths, and two half baths. Elevated into the canopy, the master bedroom has a treehouse feel. 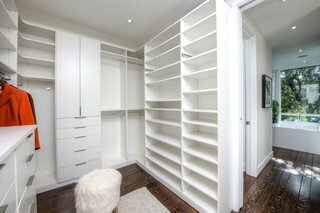 A peek into the walk-in closet next to the master bath. 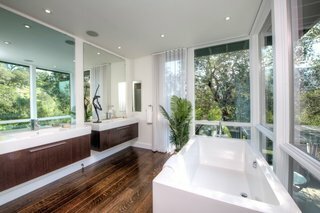 The master bath includes double vanities, a freestanding bathtub, and a hidden built-in television. The elevated site, a 1.38-acre lot hidden from street view, overlooks the spectacular landscape that drew the political power couple to the property years ago. 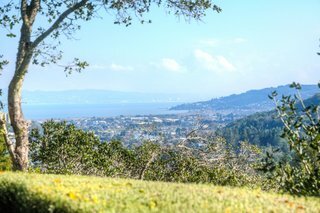 Sweeping vistas of Mount Tamalpais and the San Francisco Bay can be enjoyed from within the home and from the meticulously maintained grounds, which include flat lawns, olive trees, a swimming pool, a spa, and a dining pavilion. Hedgerows lend the property an element of privacy without detracting from views. The house overlooks views of the San Francisco skyline and the bay. Views of Mount Tamalpais can also be seen from the house. Meanwhile, the Newsoms have snapped up a $3.7 million Victorian mansion in the East Sacramento neighborhood of Fair Oaks, a 25-minute drive from the state capitol building. Oak floors feature throughout the home. 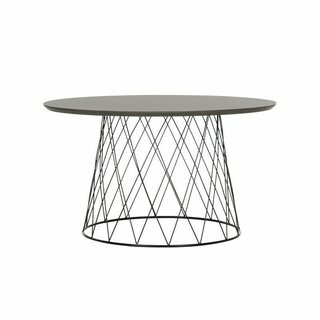 Simple, sophisticated storage. 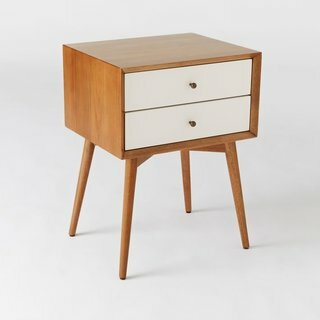 Inspired by mid-century design, the Mid-Century Nightstand borrows its slim legs, angled face and understated retro details from iconic '50s and '60s furniture silhouettes. 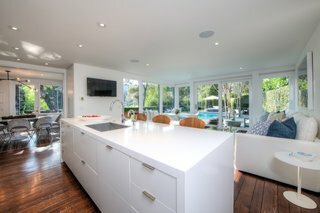 The kitchen with a center island is flanked by the dining room and sitting room. The ground-floor office is wrapped in walls of blue. 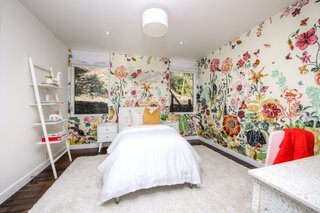 Colorful wallpaper injects a pop of whimsy into the midcentury modern home. The house include five bedrooms. 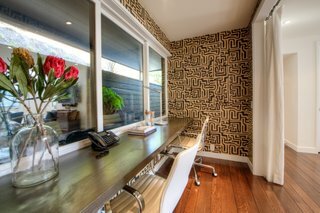 A small office nook branches off from a family room. The home includes four full baths. 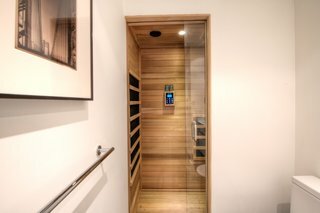 One of the bathrooms includes a dry sauna. 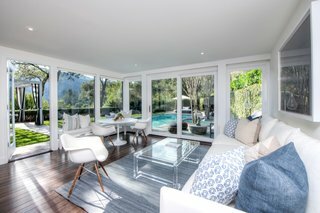 11 Rock Road, Kentfield, California, is currently listed by Vanguard Properties for $5,695,000. See the full listing here.